Beneath the endless sky of northeastern Arizona spreads an arid rainbow wilderness called the Painted Desert, where streaks and bands of bright colors twist across a tortured landscape that bears the signature of unimaginable time. 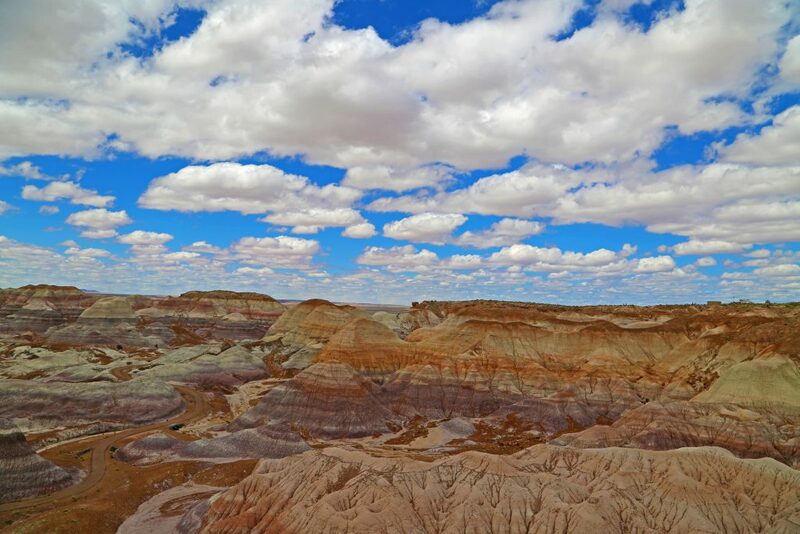 It is a magical and mysterious land, and nowhere is the mystery more intriguing or the magic more enthralling than in the swatch of blistered badlands along its southwestern edge, the Petrified Forest National Park. Here erosion eats away at a high, grassy plateau, creating a barren disarray of tinted cones and buttes, hills and gullies, reshaped and redefined by every rare rainstorm. When water turns sun baked clay to slippery ooze, only those ridges, peaks, and spires that are protected by resistant rocks are likely to hold firm. Regularly emerging from this convoluted chaos are wonders from the distant past: the bones of long-extinct animals, the delicate fossils of ferns, and, above all, the colorful remains of mighty fallen conifers now turned to stone. In a region where vegetation is reduced to a few twisted junipers, low shrubs, sparse cacti, bunched grasses, and ephemeral wildflowers, the huge, shattered tree trunks seem strangely out of place. The Paiutes said that they were the arrow shafts of Shinauv, their thunder god. 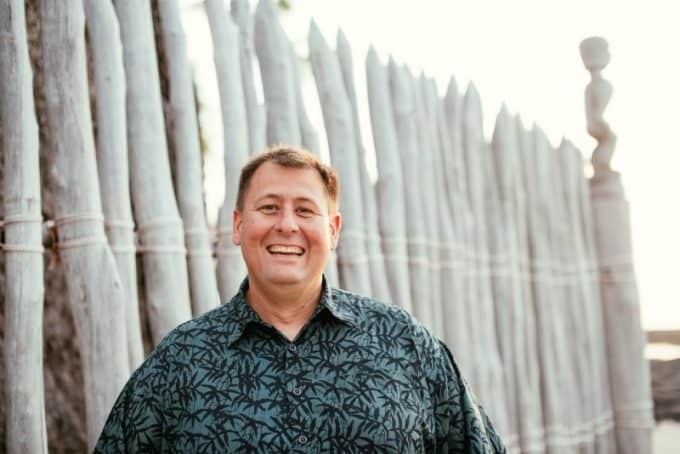 The Navajos thought of them as the bones of Yietso, a great mythological giant. Each piece is a unique creation that blazes with the colors of the land itself, a wild patchwork of rust-reds, state-blues, tobacco, yellows, smoked purples, burnt oranges, antique whites, and all shades between. Mixed into their substance are rare pockets of semiprecious stones: rose quartz, smoky quartz, jasper, amethyst. You can still read the life histories of a few of the trees in their annual rings. The surfaces of many are pockmarked with dimples left by a wood-destroying fungus. In the remains of some you can see the tunnels of prehistoric insect larvae. But, though the logs resemble wood, they no longer have its soft, spongy texture. They are dry and brittle, hard enough to scratch glass, and they weigh 150 to 200 pounds per cubic foot. The name “Petrified Forest” is really a misnomer, for most of the petrified trees that are found here grew some distance away and were washed to this burial ground by rivers and streams. There are few standing stumps, and even fewer trunks that have roots or branches. Agate Bridge, a 100-foot log, spans a shallow arroyo like a stone footbridge, but the other huge trunks were broken to firewood lengths by long-ago quakes and stresses in the earth. Now they lie scattered as though strewn by some giant hand. Some bright chunks cap pedestals of clay, their stony hardness having long protected the softer material from erosion. 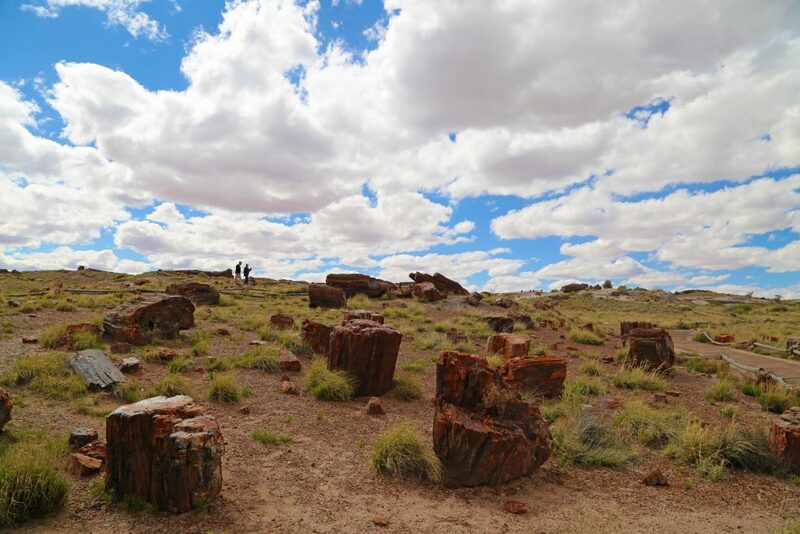 Check out all of these great things to do in Petrified Forest!